Oswego, NY – Morningstar Residential Care Center resident Mildred VanBuren, known by friends and family as Millie, celebrated her 100th birthday recently with a party and four generations of family members. Shown pictured at the Oswego-based care center (formerly Sunrise) are VanBuren family members from left to right back row: Great-grandson Zachary; Grandson Sean; son Daniel; and Grandson Mark. 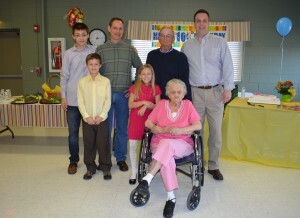 In front are Great-grandson Tristan, Great-granddaughter Cierra, and the birthday girl herself, Millie. Millie was born in Wellsville, NY, where she lived with her eight brothers and two sisters. She worked previously at Nestle in Fulton, as well as the former Breneman- Hartshorn Shade Co. in Oswego. Millie also spent much of her time volunteering for St. Luke Health Services, also located in Oswego. Morningstar Residential Care Center is a family-owned and operated, 120-bed long-term and sub-acute care facility located at 17 Sunrise Terrace in Oswego. The center offers long-term care; full rehabilitation services including: physical, occupational and speech therapy; post-surgical orthopedic care; respiratory care; and additional acute care services. Morningstar is made up of a team of registered and licensed nurses, physical/occupational/speech/recreational therapists, social workers and dieticians. For additional information please call (315) 342-4790.